There’s a surfeit of cafes in Australia, reflecting no doubt what’s happening all around the world — at least in aspirational, bourgeois euro- and anglo-centric urban and semi-urban settings. It’s a fact bound to impress itself on the returning tourist, who meets the phenomenon with some gratitude. There’s always somewhere to rest, to recuperate, it’s familiar, safe, and we know the rules. 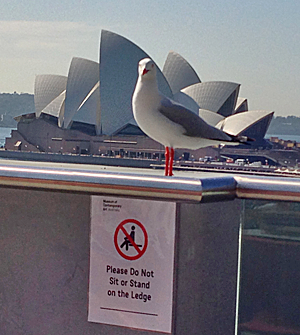 I met up with a friend in Sydney I hadn’t seen for years. We met in the lobby of a formal 1970s office block in George Street in a space once occupied only by a formal reception/security desk. Now there’s the inevitable cafe filtering into the lobby with the scent not only of roasted coffee but of toasted cheese and aubergine. Formal stuffiness gives way to the clanging of crockery, paper number cards on tiny chrome pedestals, and polite waitering. Such features make up one of the ambient layers of the contemporary city. Coffee, and what goes with it, is dispensed in foyers, plazas, office blocks, malls, campus libraries, galleries, water fronts, main streets, lanes, parks, leisure centres, and department stores. 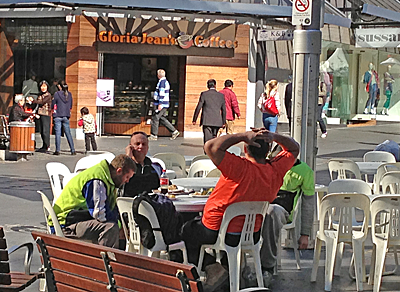 In busy urban centres they often adjoin one another and seem to interconnect, forming a personable meshwork of aluminium or plastic tables and chairs, sunshades, tripping waiters, and crockery. I’m sure they have something to do with the mood of a place. 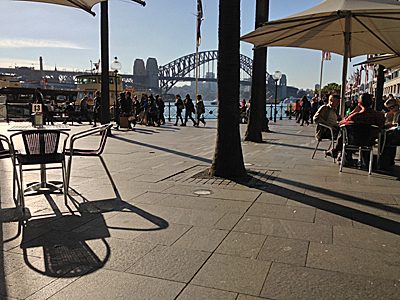 Cafes are branded meeting places — whether local, global, franchised, or chained. We looked at the character and potential of such spaces in our Branded Meeting Places project. 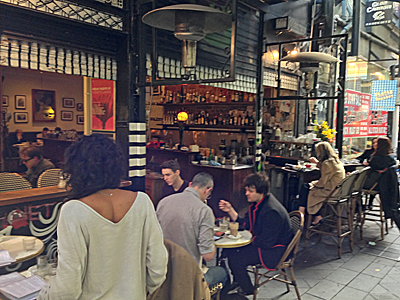 Cafes represent a softening of the architectural edge, particularly in public spaces. In the right climate and the right time of day they provide a soft edge condition, occupied if not by people then at least human-scaled furniture, a role uninventive architects once handed over to trees and shrubs. Cafes provide an income stream that makes this softening of the edge easier to maintain and more sustainable than planting, screens, free-to-access activity spaces, and other inventive uses. “Bourgeoisisation” of public places: I don’t think that’s a word, but I recall Richard Williams’ book chapter on the obsession among British architects to recreate the putative mood of Mediterranean towns in British cities — contrary to climatic constraints. Such spaces are a kind of fantasy, and have to wrestle with the conflicting activities of homeless people and groups of teenagers who want somewhere to hang out with their cans of Irn-Bru and packets of Pringles. Such spaces include, but they also exclude. Cafes are outdoor spaces, or at least they aspire to connect with the outdoors, even in a British winter. There’s a link here with the “soft fascination” provided by natural settings and dining al fresco. There’s something primitive about communing over food and drink under shade, even if imagined. What do people do in such spaces? It’s as if tablet computers, e-readers and smartphones were invented to give people something to do in such spaces. Now you can sit for hours, alone or with others, communicating with the world, and the world of work. Coyne, Richard, James Stewart, Mark Wright, Henrik Ekeus, Robin Williams, and Penny Travlou. 2010. Branded meeting places: Ubiquitous technologies and the design of places for meaningful human encounter. In T. Inns (ed. ), Design for the 21st Century: Interdisciplinary Methods and Findings: 146-159. London: Gower Ashgate. Laurier, E., A. Whyte, and K. Buckner. 2001. An ethnography of a neighbourhood café: informality, table arrangements and background noise. Journal of Mundane Behaviour, (2) 2, 195-232. Laegran, Anne Sophie, and James Stewart. 2003. Nerdy, trendy or healthy? Configuring the Internet café. New Media and Society, (5) 3, 357-377. Williams, Richard. 2004. The Anxious City: English Urbanism in the Late Twentieth Century. London: Routledge.